It doesn’t seem like 5 minutes since I was writing our Medica blogs last year, and here we are again, getting ready to jet off to Germany for Medica 2015! This will be my 4th year visiting Medica on behalf of Martel, and I have to say it’s one of my favourite tradeshows to visit. With it being the biggest medical tradeshow in the world, you get to see all the latest products and what the future of the medical industry may look like. One of the main things I get out of Medica is that it’s a chance to catch up with some of our European distributors, and customers. Along with getting to meet potential new customers. To celebrate my 4th year visiting Medica, I’d like to be the first to offer you this amazing discount on the thermal printer store. 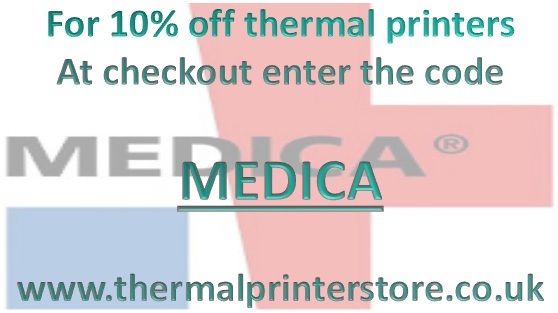 By using the code MEDICA, we are offering you 10% off all of our thermal printers in the store that can be used alongside medical devices. We hope that everyone has a successful show and I look forward to seeing everyone in Dusseldorf!